We have teamed up with Canagan to offer all you cat owners out there the chance to win a hamper of their fantastic Cat Food! Never heard of Canagan? Canagan is a brand of pet food for both cats and dogs. Canagan pride themselves on being Britain's finest grain free dog and cat food. Their best nutritionists have researched the dietary needs of both dogs and cats. Canagan did this so they could make foods which meet your pet's dietary needs as well as creating a diet which closely resembles those which would have been eaten by your pet's ancestors. While also containing the right ratio of meat protein and fat to carbohydrate. That means that Canagan has a higher meat content than most too! Not only do Canagan ensure their products are the right ratio of foods for your pet but they also use only the best ingredients in their foods. The meat and fish used inside pet food is chosen to be wholesome and delicious while provides tons of nutritional value since dogs and cats are carnivores and will get better nutrition from meat sources. Which also connects to why Canagan is grain free, dogs and cats will find grains much harder to digest since they would have hunted and eaten meat in the wild before domestication. That means Canagan pet foods will best match their ideal nutritional and natural food. Canagan pet food would be the perfect, delicious food gift for your cat or dog this Christmas! Inside the hamper we have to giveaway there are three different flavours of Canagan cat food. Firstly there will be Canagan Chicken with Vegetables Grain Free Wet Cat Food which is made using skinless chicken. The food is simply tender cooked chicken which is cooked in its own gravy with vegetables. Containing 58% Chicken, 30% chicken broth and 8% vegetables ( 4% of each carrots and pumpkin). 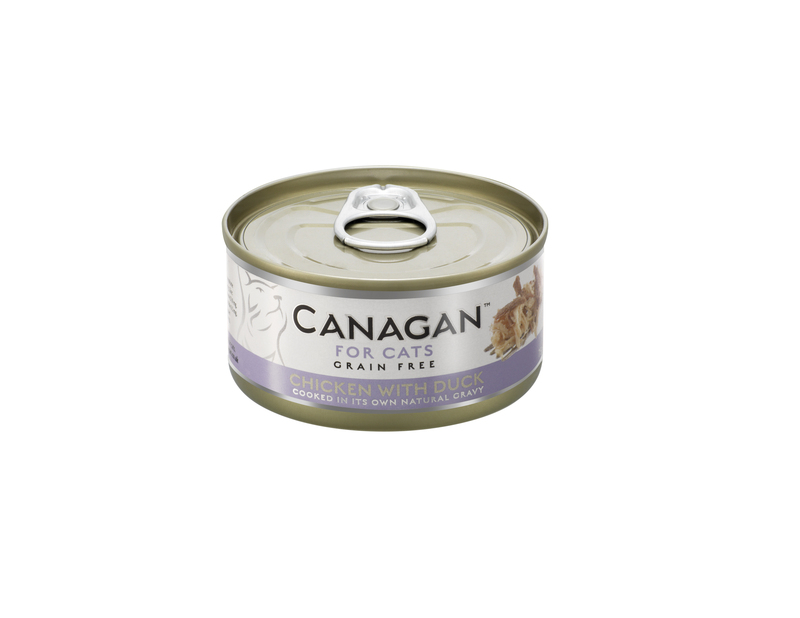 Another nutritionally whole cat food you will find in our hamper is Canagan Chicken with Beef Grain Free Wet Cat Food. Which contains some tender shredded chicken along with morsels of beef which has again been cooked in its own gravy. Containing 58% chicken breast and 5% beef which ensures your cat will get the best nutritional value. 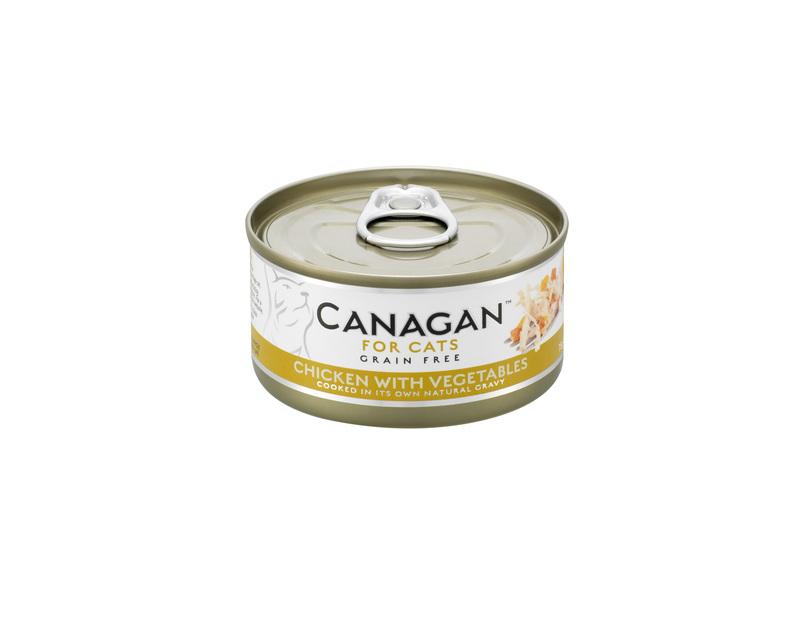 The third cat food featuring in our hamper is Canagan Chicken with Duck Grain Free Wet Cat Food. Made with tender shredded chicken with some morsels of duck cooked in its own natural gravy. Containing 58% chicken, 32% chicken broth and 5% duck. All three of the Canagan cat foods from the range are highly nutritious for your cat with vitamins and minerals and sunflower oil also in their composition. You can use any of the wet pet foods in the You can use Canagan range to accompany dry pet food too! 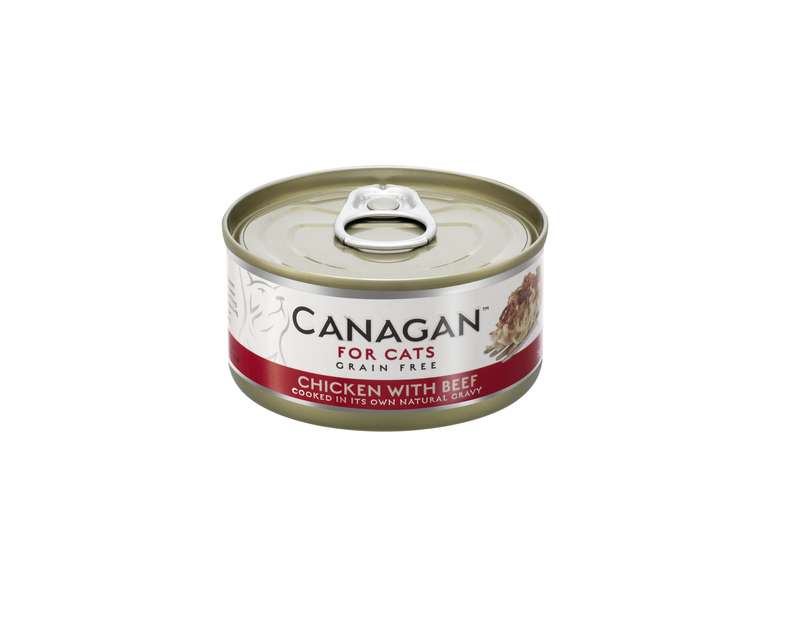 All three flavours of Canagan are available to purchase in packs of 12, 75g cans using the links Canagan Chicken with Vegetables Wet Cat Food (£14.28), Canagan Chicken with beef Wet Cat Food (£14.28), Canagan Chicken with Duck Wet Cat Food (£14.28). You can enter to win the Canagan cat food hamper below using the link to the Gleam widget. Please be sure to read the terms and conditions listed below before entering. Canagan is the sponsor of this giveaway and is responsible for prize fulfillment. I think my cats would love the Canagan Chicken with Beef Grain Free Wet Cat Food. Chicken with vegetables I think would be cat's favourite. The Canagan Chicken with Beef Grain Free Wet Cat Food! I have just bought a new 8 week old kitten and I have been researching cat food like mad, several people, including a friend who works in a pet store have raved about Canagen cat food so I am going to order some online, I think my Jasper would love the Canagen Chicken with Duck wet cat food. I assume my puss might actually quite like the Canagan Chicken with Duck Grain Free Wet Cat Food. I have 4 cats, I am sure they would love them all! He would especially enjoy Chicken with duck, although he would like them all. You can never really tell with my three, but I suspect it would be chicken and duck! Has to be the chicken with vegetables i know they would love this! It would definately be the Chicken with vegetables. Chicken with duck, he goes crazy for both of those. The chicken and veg without a doubt. the chicken, my 2 cats are very fussy!! the chicken, my 2 cats are very fussy! Minnie would love Chicken with Duck! I think the chicken with duck would be the favourite of our two cats. My current foster cat would love the chicken and vegetables. I have six cats who between them would enjoy polishing off all the flavours. I think the Chicken and Duck would go down well! I would guess the chicken and vegetables but who knows? Cats can be unpredictable with their likes and dislikes. Chicken with Beef would be good to give a go!! Ollie would love the Chicken with Duck. I think my cat would love the Duck one. I think my cat would like the duck flavour the best. Canagan Chicken with Vegetables Grain Free Wet Cat Food would be ideal for George who hates anything BUT chicken and anything with grain in makes him a bit "whiffy" if that makes sense. Great prize.